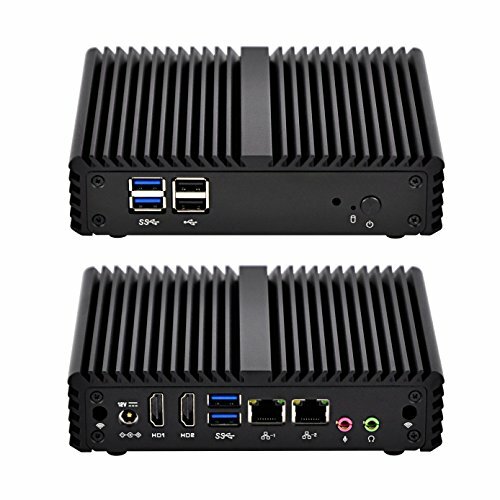 1)Fanless, quiet, cheap, small, compact, with 2 Gigabit NIC, Mini PC Q150S is a perfect fit for a LAN or WAN router, firewall, proxy, VPN appliance, DHCP Server, DNS Server, etc. 2)It can act as a host, applying to home, office, restaurant, bank, supermarket, library, hospital and almost of where need a computer. 1.For all the mini pcs you bought from us, we provide a full one-year warranty, Lifelong technical support. 2.We assure you that all the mini pc and accessories have been tested before delivery,if you have any question,pls contact Qotom at any time,we can provide Windows drivers and motherboard User Manual download link. CPU:Intel Baswell Processor J3160 qual-core 1.6 GHz,Up to 2.24 GHz,AES-NI,With aluminum+metal fanless design. It can work stably without noisy. It supports Windows 7, Windows 8, Windows 10, Linux, etc,We pre-install Unactivated Windows 7 for test and we do not provide any Windows license. If you prefer to other OS, please contact us. 1)Fanless, quiet, cheap, small, compact, with 2 Gigabit NIC, Mini PC Q150S is a perfect fit for a LAN or WAN router, firewall, proxy, VPN appliance, DHCP Server, DNS Server, etc. 2)It can act as a host, applying to home, office, restaurant, bank, supermarket, library, hospital and almost of where need a computer. If you have any questions about this product by Qotom, contact us by completing and submitting the form below. If you are looking for a specif part number, please include it with your message.